A general solution is a solution put in a compact form involving an integer and generalizes by means of periodicity. 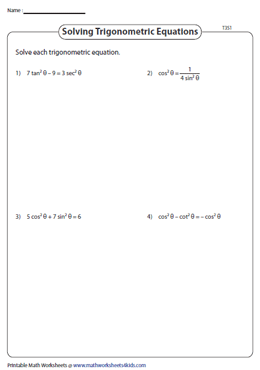 Give learning a head start with these general solution of trigonometric equations worksheets featuring trig equations to be rewritten in different forms such as sin θ = 0, cos θ = 0 or tan θ = 0 and sin θ = sin x, cos θ = cos x and tan θ = tan x, find the general solutions using trig identities and appropriate formulas. Learn to simplify trig equations as well. Rewrite the equations provided in these exercises in the form of sin θ = 0, cos θ = 0 or tan θ = 0. Obtain the general solution of the equation by using the appropriate formula. Modify the equation and write it in the form of sin θ = sin x, cos θ = cos x or tan θ = tan x. Apply the relevant formula and find the general solution. 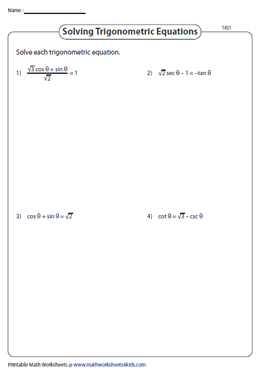 The trigonometric equations in these printable worksheets feature more than one trig function. Simplify the equation with the help of trigonometric identities and determine the general solution. Simplify the trigonometric expressions by applying the trigonometric identities. Reduce it further to the form sin2 θ = sin2 x, cos2 θ = cos2 x or tan2 θ = tan2 x. Solve each trigonometric equation by simplifying it to the form of a cos θ + b sin θ = c. Use the relevant formula to find the general solution of the equation. Validate your response with the answer key provided in each worksheet.